wellevaluations, L.L.C. 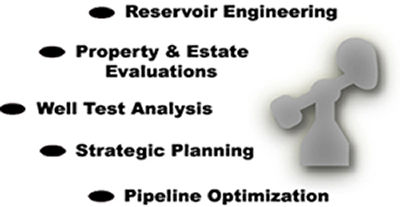 is a consortium of professionals focused on providing Strategic Planning, Engineering and Marketing for the oil and gas industry. wellevaluations, L.L.C. analyzes our client's needs from the reservoir through marketing and finance to formulate a comprehensive solution. Our professionals are unique because of their expertise in dealing with the interaction of the individual components of a problem. This understanding, of the interaction of the individual components, is the key to success in these difficult times. wellevaluations, L.L.C. has distinguished itself from its competitors by its substantial investment in state of the art computer software and training, in order to ensure timely and accurate solutions. As many of you are aware I have changed the name of my consulting business from Discovery Capital, LLC to wellevaluations, LLC. There were a couple of reasons for this. First, I bought McCoy Petroleum Corp back in July 2007, and part of Discovery Capital got merged into McCoy. The other reason is that obviously wellevaluations does a better job of describing the biggest part of what I do. I have asked my website guru to change all reference to Discovery Capital to wellevaluations LLC. I should have done this a few years ago, but I should have done a lot of other things years ago as well. With my responsibilities at McCoy it is getting very difficult to take on any large projects. I am still happy to evaluate well tests and offer opinions (which I am never short of).